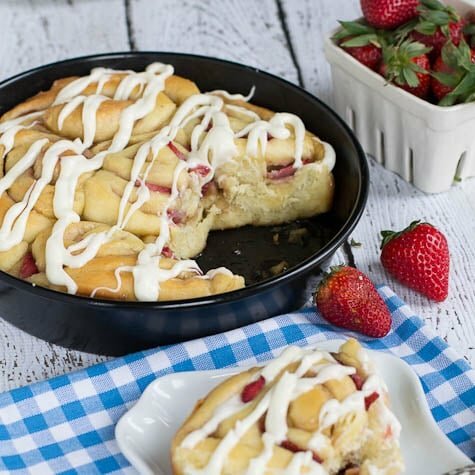 Soft and fluffy Strawberry Sweet Rolls stuffed with fresh sliced strawberries and finished off with an almond cream cheese drizzle are a wonderful way to show off those beautiful in season strawberries. I keep wanting to call them cinnamon rolls, but they don’t have any cinnamon in them. I’ve wanted to make homemade cinnamon rolls for a long time. I was raised on Pillsbury Cinnamon Rolls, sticky buns as we called them, and the only real cinnamon rolls I have had have been from bakeries. And to tell you the truth, a lot of times I find them to be really lackluster. I’d rather have the Pillsbury ones. 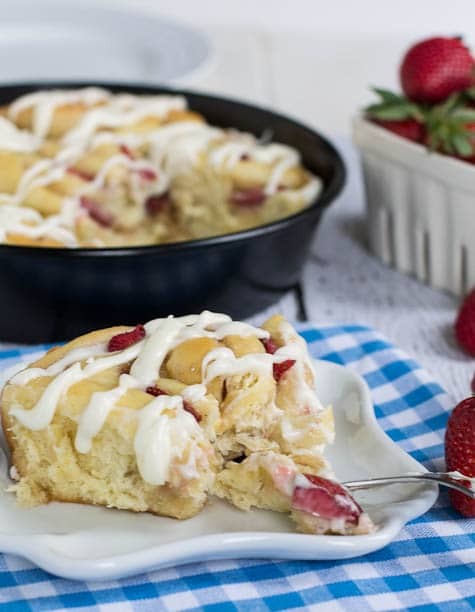 Well, these homemade Strawberry Sweet Rolls take a little time and effort, but then end result is extremely delicious. The dough bakes up tender and soft with just a hint of sweetness. The strawberries provide lots of flavor and the cream cheese drizzle really sweetens them up. I don’t work with yeast very often and I always have to cross my fingers and hope it does its magic. In this case the dough came together amazingly well. Even when I was kneading it, I could tell it would be a winner. It just felt good in my hands, so soft and springy. I’m super careful about getting the temperature of the water right when using yeast. I know a lot of people can just touch the water and know that it is at the right temperature, but I need to use a thermometer. Killing the yeast with water that is too hot is no fun. If your house is on the cool side this time of year, you can put the dough in the oven with a pan of warm water (leave the oven off) to rise. Or just put it in the oven with the oven light on. I like to throw a load of wet clothes in my dryer and put the dough on top of the dryer. But don’t stress out about finding a warm place. The dough will still rise at room temperature, it will just take longer. You can start these a day in advance and either let the dough do its first rise in the refrigerator overnight or get the rolls all assembled in the pans and place them in the refrigerator overnight. Let them sit at room temperature for about an hour before baking. And if the strawberries have given off a bunch of liquid, pour some of it off so the rolls don’t get soggy when they bake. Now that I’ve had success with homemade cinnamon rolls, without the cinnamon, I have a feeling I’ll be making them again and again with different flavor combinations. Homemade sweet rolls stuffed with fresh strawberries and brown sugar topped with a cream cheese drizzle. Combine yeast, warm water, and 1 teaspoon sugar in a glass measuring cup. Let stand for 5 minutes. Using an electric mixer, beat 1/2 cup butter at medium speed until creamy. Gradually add 1/2 cup granulated sugar and salt. Beat until light and fluffy. Add eggs one at a time, beating to incorporate. Add milk and lemon juice and beat until blended. With mixer on low, add yeast mixture. Gradually add the 4 1/2 cups bread flour and then add the nutmeg. Beat on low speed 1 to 2 minutes. Sprinkle about 1/4 cup flour on a flat surface. Place dough on surface and knead until smooth and elastic, about 5 minutes. You can add a little extra flour if necessary to keep dough from sticking to your hands and the surface. Lightly grease a large bowl with vegetable oil and place dough in bowl. Turn dough so that all sides are coated in oil. Cover with a clean dish cloth and let rise in a warm (85 degree) place, free from drafts, for 1 1/2 to 2 hours or until doubled in size. Punch dough down and place on a lightly floured surface. Roll into a 16X12-inch rectangle. In a small bowl, mix together 6 tablespoons butter and strawberry jam. Spread on dough. Sprinkle with brown sugar and scatter sliced strawberries across dough. Starting at one long end, roll up jelly-roll style. Cut into 14 slices and place in 2 lightly greased round cake pans. Cover and let rise in a warm place for 1 hour, or until doubled in bulk. You can also refrigerate overnight and let rise in the morning for about 1-2 hours. If you do this, there will most likely be liquid from the strawberries in the bottom of the pan. Pour out about 1/2 of the liquid so that the rolls will not get soggy as they bake. To make cream cheese drizzle, beat cream cheese on medium speed with an electric mixer. Gradually beat in powdered sugar. Mix in both extracts and milk. Use a spoon or a ziptop bag with the corner clipped to drizzle on sweet rolls. This entry was posted in Breads and Muffins, Breakfast and tagged Cinnamon Rolls, strawberries. Bookmark the permalink. Spring is all about the strawberries 🙂 Have a great weekend Tina! What a fun twist on the usual cinnamon rolls. I have been seeing lots of fresh strawberries at the market and can’t wait to give these a try. I’d like to order all of these, please. Oh, and they’re all for me… no sharing. Ha! I always put my dough on top of my dryer when it’s running a load of clothes and shut the door (it’s a small little room so it gets warm fast!). And I agree with you – so many times I’m so so disappointed by bakery sweet rolls. 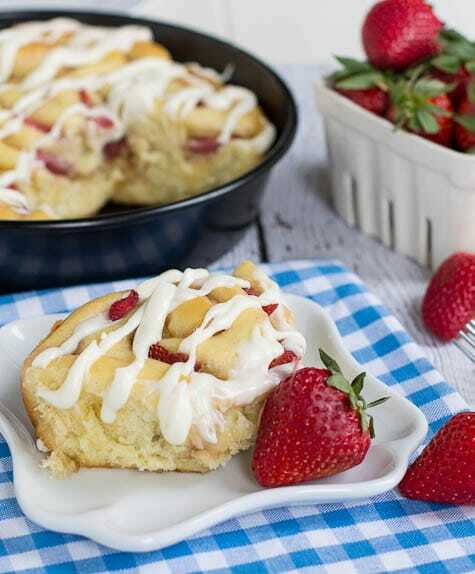 These look amazing – with strawberries and that almond cream cheese drizzle?? It works great doesn’t it? It’s been so cold here the last few days, I’m thinking I may need to shut myself in the laundry room with the dryer on! I think even the sharpest of home cooks are intimidated by yeast at some point. I certainly was, but practice really makes perfect. The more you bake with it the easier it gets! Did I say these look awesome?! I grew up having a sweet roll for my breakfast each weekday but none would have been anywhere near as good as these look. I must learn how to bake with yeast and I must make these rolls! They look so tempting! Nice work! These rolls look so pretty with the strawberries…like the texture…look so light and fluffy…and yes the cream cheese on it just add a nice touch to this rolls. I’m pretty sure I imagined these in my dreams! 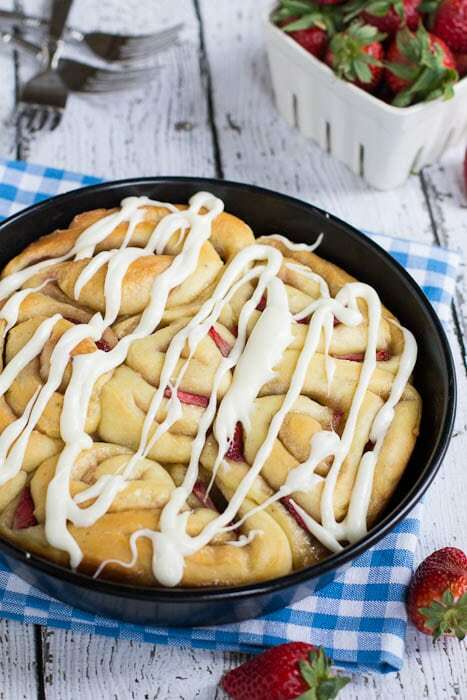 Love anything strawberry and these sweet rolls look incredible! Oh yes, I need these rolls in my life. Strawberries and sweetness is perfection. 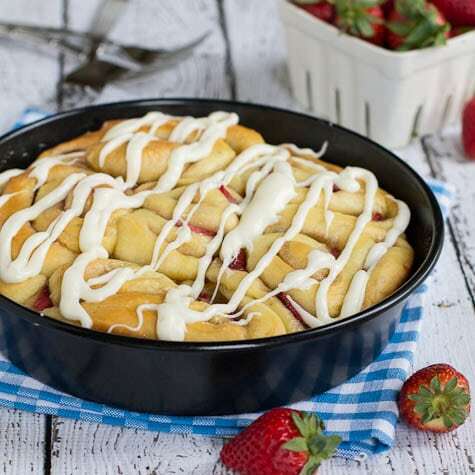 Never have had a strawberry flavored sweet roll. This recipe looks awesome. Love that you pointed out your intimidation with yeast…I feel that way most of the time! I need to use it more so I become more comfortable with it 😉 thanks for sharing! Beautiful breakfast rolls! 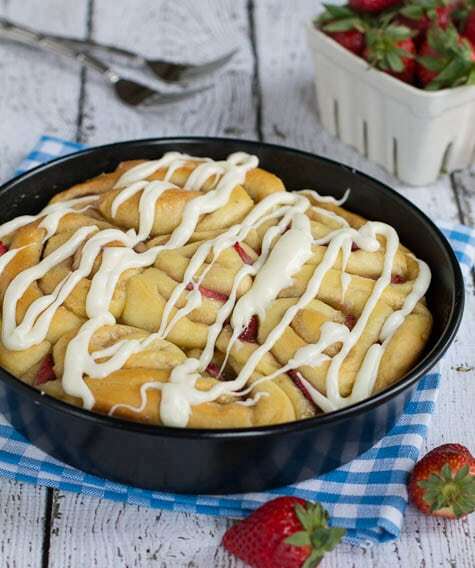 Strawberries work so well in sweet rolls, don’t they! They provide just the right amount of tang to balance out all the sweetness! Yum!